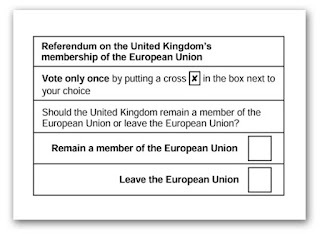 The photograph above is my vote on a ballot paper on the EU referendum. 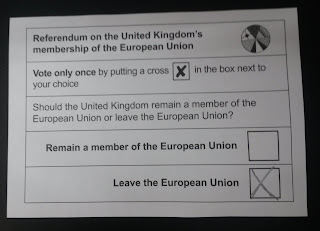 After circa 40 years I have at last had the opportunity to register my objection to membership of an anti-democratic political union - a union which is a relic of an early 20th century project attempting to solve a problem which no longer exists. It's been well documented, even by its own internal Wilson report, that the UK public broadcaster is less than impartial when it comes to reporting on the EU accurately. And it's also well documented that the United States is keen on UK membership of the European Union for reasons that are less than altruistic as the above quote illustrates very clearly. The US was always going to interfere, it wishes to have a relationship with a nation state with whom it has historical connections but which is subordinate to a supranational body. 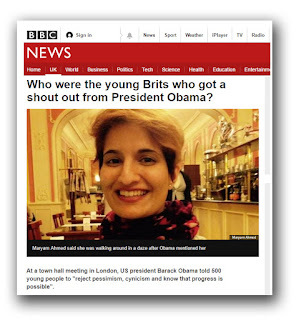 At a town hall meeting in London, US president Barack Obama told 500 young people to "reject pessimism, cynicism and know that progress is possible". Obama hasn't mentioned specifically the EU, but the phrase of "rejecting pessimism and cynicism" makes it transparent of what his message is, given his previous statements during his current stay in the UK. 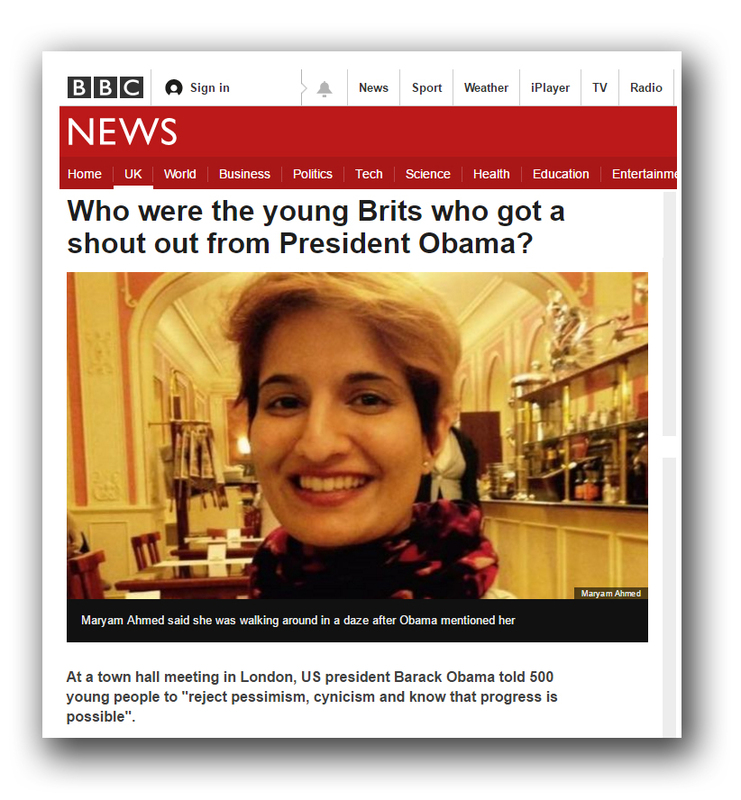 And then follows a relatively long piece BBC about Obama which includes interviews with an "international relations student" who's "a non-binary person", an "ethnic minority president of the Oxford University Conservative Association" and "a campaigner on disability and violence against women". All of which sounds very progressive and positive. When we consider the recent fuss about the "debate" - if we can call it that - with Boris Johnson's ill informed intervention regarding Obama's comments on UK membership of the EU, describing the lame duck US President as "part-Kenyan", the inference and context of Obama's recent comments becomes obvious. The debate is being framed as a well meaning progressive Cameron against an idiot colonial and out of date Boris. Obama is using well rehearsed emotional issues to attempt to isolate the Brexit campaigners as those who are not normal without, in this report, having to mention the EU. Thus the BBC doesn't have to show "balance" in this particular piece as part of its referendum reporting. In this sense the referendum is going according to plan. It is a repeat of 1975. It's not like we weren't warned. We knew the BBC would be unfair, we knew the media be unfair, we knew Cameron would lie and we knew American and other countries would interfere. We knew this. 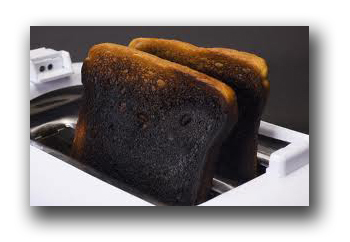 And that was the point of an exit plan - it allowed us to launch an effective pre-emptive strike. By having a progressive positive plan we would have negated the effectiveness of an American President's intervention. Instead we are increasingly being lumbered with Boris, a politician without a clue who this blog has long been less than convinced that he is a Eurosceptic Tory - if that term is not an oxymoron. It's within this context it becomes increasingly difficult to tell whether Boris' current disastrous intervention in the referendum campaign is the result of idiocy or perhaps more cynically an attempt to hijack the leave campaign and deliberately ruin it, The latter would be very much in keeping with his and his family's well established pro-EU views. The outcome though as it currently stands is the leave campaign loses, Failing to learn these lessons of the obvious mistakes of the past are now coming to pass....again. 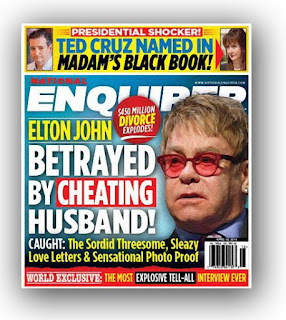 Above is a screen print of a recent American publication - National Enquirer - which has made forthright allegations regarding the songwriter Elton John's private life, more specifically the circumstances over his married life. It is an issue which has now become a Westminster one - vexing the UK media who are currently unable to report explicitly the implied sordid details as they are obviously desperate to do so. Conversely the National Enquirer is able to be so publicly indiscreet by virtue of being protected by the American Constitution, it can go where the UK media fears to tread, restricted by domestic privacy law - a law heavily inspired from Brussels but fully enforced by a very compliant British establishment. This lack of ability to report what is common knowledge worldwide on the internet has lead to a series of articles in the UK media, particularly the Daily Mail, spitting feathers at its inability to name Elton John and crucially his married partner Furnish, as part of an injunction. With this in mind we note that the website PopBitch gives a detailed insight on how newspapers, and therefore readers, can circumvent injunctions by laying down many clues for the readers to follow while not being in contempt of court. However and much more interesting for this blog is not Elton John's private life - we couldn't care less about that - it is the observation of the vigorous manner the media have attempted to frame the issue as one of free speech, a deceptive attempt for the media to portray itself as upholding the principles of the fourth estate. This is contentious. Instead it seems that it is details of Elton John's private life which is the media's concern not the responsibility holding the establishment to account which the fourth estate apparently prides itself on doing. Free speech is something this blog fully embraces, it is the sunlight that exposes the powerful. But we are left in a position where we have to question the direction of the sunlight from the legacy media. Where is the Super Trooper being aimed at? Celebrities? Or trying to inform us on how our country is governed. The answer resides in the so- called journalistic principles regarding Cameron lying about "vetoing" an EU treaty in 2011 which never happened, or that Cameron's so called negotiations earlier this year were less than impressive and involved directly lying to Parliament or that there's an exit plan which is doing the rounds in Whitehall which is being comprehensively ignored. In addition why, for example, has the Daily Telegraph have a editorial block on the word "Flexcit" - the only publicly available feasible EU exit plan - being used in its articles by Telegraph paid authors and why has the media failed to report that the Electoral Commission has allowed itself to be completely bullied regarding the time scale of the referendum to the extent it fully capitulated with no fuss. The legacy media cannot be unaware not least due very often to the comments under the articles which robustly alert them to their mistakes; comments which are often patronisingly dismissed as"below the line". Perhaps in this context can we consider it more than a coincidence that the revamped pro-EU Telegraph website no longer accepts comments. 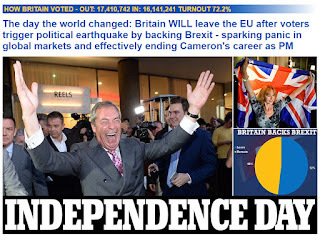 A change which has occurred just before an EU Referendum? 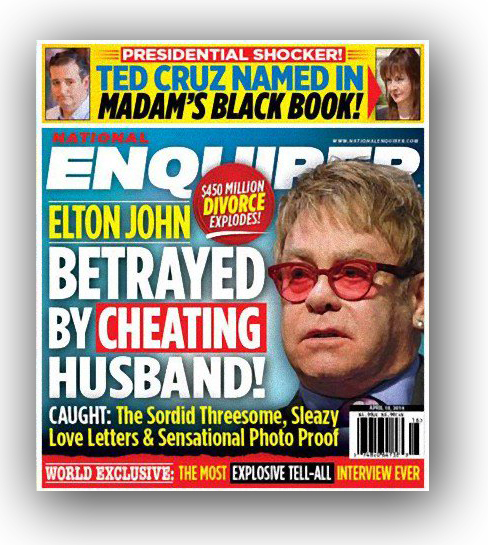 We are tempted to conclude therefore that regarding the UK media if Elton John truly wants a private life then all he needs to do is have a photograph of him prominently holding up a copy of Flexcit. The self censorship of the media will do the rest for him. It would have been more effective and would have been a hell of a lot cheaper. If Cameron was expecting favourable headlines this morning regarding his so-called negotiations then he will be sorely disappointed. Dubbed a "Cam sham" the tone of the coverage illustrated by the front pages above has been savage and rightly so. 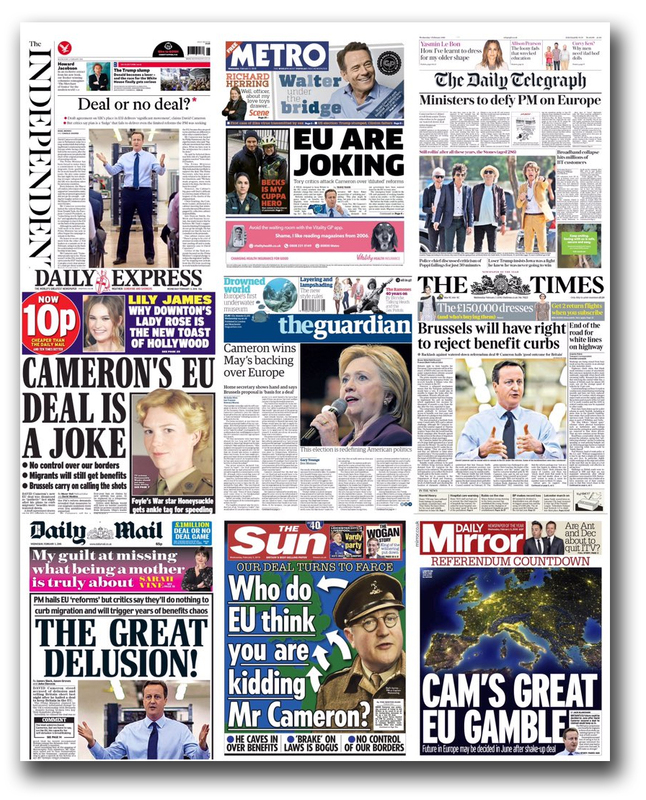 Cameron's so-called negotiations have been exposed for the nonsense they currently are. As EUReferendum superbly dissects, despite Cameron's boast there are "substantial changes", there are no economic safeguards, no migrant safeguards, no end to "ever closer union" and no red card. Economic safeguards, ever closer union and red cards all require treaty change, a treaty which so far has every sign of having been put on hold. Cameron's migrant safeguards amount to little more than the UK having permission to ask the EU Commission for permission. I presume the Commission's permission will be delivered to Cameron "by fax". Yet it could still get even worse for Cameron. Lost Leonardo notes that these non fundamental reforms "may not even be the end of Mr Cameron’s humiliation. The proposals now have to be assessed and picked over by the 27 other EU Member States, which may raise further objections in the upcoming European Council meeting, later this month". 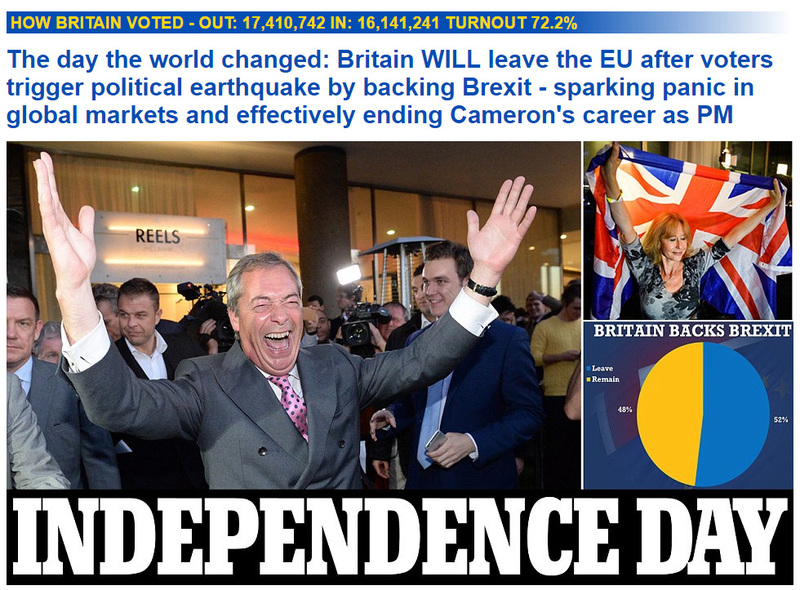 Initially this leaves us rather optimistic that a referendum can be won. Without any kind of 'meaningful reform', and I use the term loosely, the polls have long suggested that the leavers will win. But and there is a very significant but and it's one which leaves us distinctly uneasy. 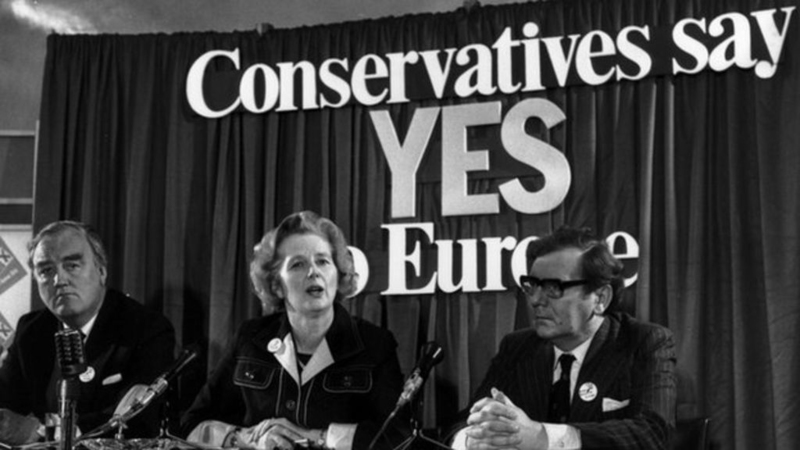 From experience and from studying the 1975 referendum there were certain expectations of Cameron's strategy. Substantial reform of course was never on the cards and so our anticipation of a deal was low, but delivered with plenty of spin. In addition we expected plenty of theatre (preferably during late 2017 when the UK holds the rotating Presidency of the Council of Ministers), expectation management and the last minute reform rabbit out of the hat. All helped along by a "Pauline conversion" by the so-called right wing press such as the Mail who have always supported EU membership while not making it obvious. No where was this more apparent than over media reports of Cameron's phantom veto - which never happened. We also have to consider that Cameron is being advised by the Civil Service, EU bureaucrats and other countries such as the United States, none of whom we should underestimate particularly as they all have vested interests in us staying in. Yet despite that Cameron doesn't even seem to have managed to reach the very low bar he set himself, has left himself open to humiliation and instead of a last minute attempt at a big white rabbit has allowed the internet to have five months to completely ridicule his plans before a June referendum (if he is planning one). Further concerns come to the fore when Boris Johnson, arch Europhile, suggests that "David Cameron 'made the best out of a bad job' as he refuses to praise EU deal". Are we being played? Experience most certainly suggests we are. This appears too easy. Too good to be true. Is the ground being laid for something bigger. 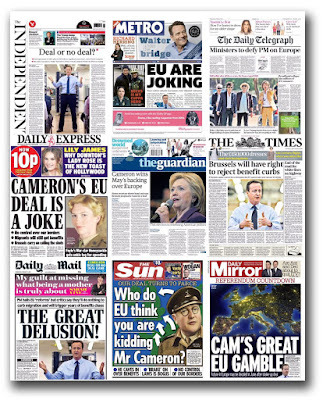 Undoubtedly it could be that Cameron has made a complete pig's ear of this referendum and the negotiations. Cameron's form on the matter so far suggests this is perfectly possible. Yet...we have to remember rule one of politics applies....never ever trust a Tory. I am writing to you regarding aspects of the media coverage of the forthcoming EU referendum which I feel could be improved. 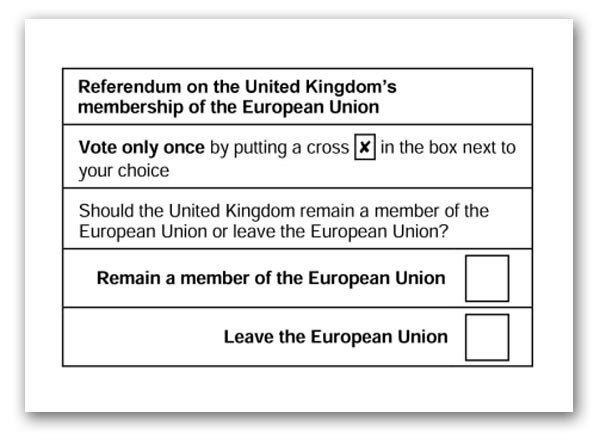 On 1st September 2015 the Electoral Commission recommended a change to the proposed question from an “In/Out” question to a more balanced “Leave/Remain” response. The Government and Parliament readily agreed to these recommendations. “Any referendum question must be as clear as possible so that voters understand the important choice they are being asked to make. We have tested the proposed question with voters and received views from potential campaigners, academics and plain language experts. ‘Whilst voters understood the question in the Bill some campaigners and members of the public feel the wording is not balanced and there was a perception of bias. The alternative question we have recommended addresses this”. 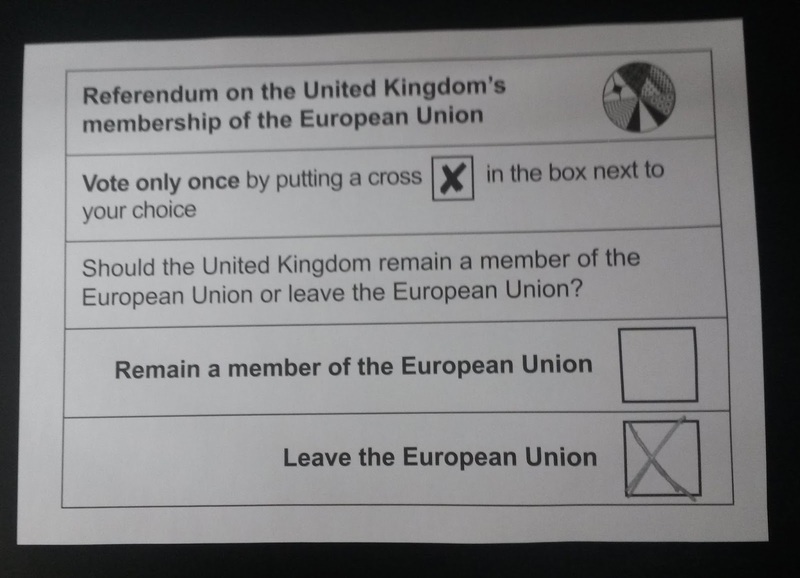 Given that the Electoral Commission’s recommendations were widely reported at the time by the media, it is of some concern that the media and newspapers in particular continue to frame their referendum pieces in an “In / Out” context rather than the actual “Leave / Remain” options on the ballot. This has potential for confusion for voters which may undermine the very balance that the change of question was attempting to address. As the Electoral Commission revealed in its ‘Media content analysis’ report in August 2011 on the AV referendum in May 2011: “The news media play a crucial role in informing voters about the issues, alternatives and candidates in an election”. In addition according to the Editor's Code of Practice issued and enforced by IPSO, "the press must take care not to publish inaccurate, misleading or distorted information". As the question was changed for the sake of "clarity" continuing to frame the debate as "In / Out" is potentially misleading. With this in mind I feel there is a case that the Electoral Commission reminds editors of newspapers of their responsibilities, as part of the process of a free and fair referendum, and that they try to avoid unintentional and unnecessary confusion by accurately reporting the question. EU Referendum: The Disintegration Of Vote Leave? It's a poor reflection on the so-called reporting skills of most of the legacy media that the dynamics between Leave.EU and Vote Leave is seen as infighting. Describing it as in-fighting heavily implies that both camps have the same objective but simply disagree over method. But as has readily become apparent over some time Vote Leave has no intention of advocating leaving the EU; a deceptive position of theirs which has been excellently exposed by Mr Brexit. Instead this is a battle to prevent a Tory plant campaign winning designation which has the suspected intention of sabotaging the referendum. If I was Mr Cameron wanting to win a referendum then an obvious tactic to deploy is make sure the opposition was under my control. And it's within this context we must see the actions of Vote Leave who have shown no explicit intentions to leave the EU despite being given many public opportunities to do so. Their evasiveness is their admission. The leaders of one of the campaigns to take Britain out of Europe were the target of a botched coup this week as infighting among Eurosceptics reached new heights. MPs tried to oust Dominic Cummings, the campaign director of Vote Leave, and Matthew Elliott, its chief executive, at a board meeting of ministers and donors on Tuesday. Bernard Jenkin, a Tory MP involved with the organisation from the start, made the move after pressure from MPs who objected to the way in which Mr Cummings was running it. The plot was foiled after Mr Cummings got wind of it in advance, tipping off friendly board members and altering the agenda to make it harder for Mr Jenkin to mount his putsch. Another source denied that the coup attempt was dead. A Tory MP faces pressure to quit the board of Vote Leave after he led a failed coup against one of its leaders. The same Spectator whose commissioning editor Mary Wakefield just happens to be married to one Dominic Cummings a director of Vote Leave. Yet Vote Leave's complete unsuitability for designation has been well rehearsed online for some time; with Elliott's previous No2AV campaign's "sharp practices", enriching colleagues and friends and less than convincing data protection practices. Vote Leave is also being hit with numerous suits over breaches of data protection and libel. And complaints are soon to emerge with Ofcom that Vote Leave's appalling website contravenes disability discrimination laws "which ensures that websites are accessible to blind and disabled users". This consideration is particularly important when applying for taxpayers' money. A campaign group which claims to represent the interests of ordinary taxpayers is using a charitable arm which gives it access to tax relief on donations from wealthy backers. The Conservative-linked Taxpayers' Alliance, which campaigns against the misuse of public funds, has set up a charity under a different name which can secure subsidies from the taxman worth up to 40% on individuals' donations. In one example, Midlands businessmen said they channelled funds through the Politics and Economics Research Trust at the request of the Taxpayers' Alliance after they asked the campaign group to undertake research into policies which stood to damage their business interests. The arrangement allowed the Taxpayers' Alliance to benefit from Gift Aid on the donations, a spokesman for the donors said. It is understood that further official complaints have been made to reopen the investigation. Interestingly Guido Fawkes has thus far remained silent on these matters. Westminster backbiting and scandal has always been his bread and butter. Yet with the potential of a major scoop ahead of the media, given his close contacts involved, there has only been silence. Perhaps that's a reflection of his financially compromised position. It's becoming clearer that the Vote Leave camp is disintegrating - it is now an organisation engaged in warfare. It's a wonder how it could ever now be designated. But the myopia of a London based media assumed, and still assume, that Vote Leave will be a shoo-in. That is now looking unlikely with Cummings increasingly resembling toast. 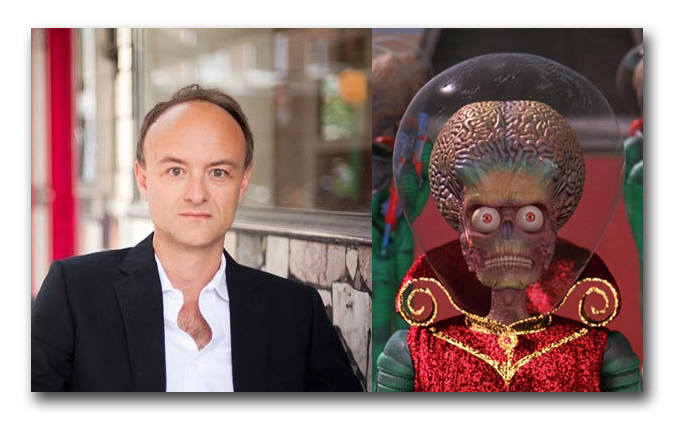 In the spirit of Private Eye's long standing "lookalikes" feature I can confirm that the picture on the left is an alien from the film Mars Attacks and that the picture on the right is Dominic Cummings. The bigger problem though for the leavers, largely overlooked by Private Eye, is that Vote Leave do not want to leave the EU - they only wish reform; they only wish remain. When push comes to shove all the Tories will rally around party and Cameron before country. Daniel Hannan and Vote Leave are continuing to take people for fools. Associate Membership is not some privileged position outside the EU. A two tier property is still a single building. Membership is membership. Britain would remain part of the EU second tier, remain bound by the ECJ, continue to receive and implement directives from Brussels. The only difference is that the full members will take decisions and further integrate to service their place as Euro currency users. Associate Membership only exists as a concept to enable this deeper integration while keeping non Eurozone countries under Brussels' control. So what Hannan is doing is trying to position continued EU membership as something other than that. He's being completely disingenuous. He is being a loyal director of Vote Leave (since 22 Dec 2015). That group has always wanted a reform deal, of the type they always demanded in their guise as Business for Britain. They never call for or endorse Brexit because they want to remain in a 'reformed' EU, and everything they do is geared to achieving that outcome. Even Dominic Cummings' notion of a second referendum only exists to reverse a vote to leave after further EU talks and some more crumbs from the table. If you want genuine Brexit, Hannan and Vote Leave are not on your side. It's becoming increasingly clear that Vote Leave is a front for Conservative continual membership of the EU. This is somewhat understandable. As any genuine leaver of the EU knows, from long bitter experience, the first rule of politics is never ever trust a Tory. The second rule of politics is to follow the first rule. With an impending referendum on the UK's membership of the EU it is becoming increasingly apparent that the obsessive SW1 party political nature of Westminster has failed to grasp that a referendum is a vote by the people. And within this context they, and the legacy media, has failed to appreciate fully that the internet has changed everything. With this in mind we can see that the referendum is beginning to smoke out the faux Tory eurosceptics who have always hidden behind a comfort blanket of party politics. General elections have allowed the Tories to express anti-EU views whilst not having to be in a position to actually advocate leaving. This lack of action not words has gone back decades. 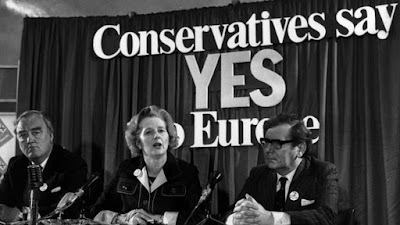 A lack of action reflected in Tory anti-eurosceptics trying to do what they have always done; making lots of noise expressing reservations over EU membership but ultimately, through loyalty, backing a pro-EU party. The forthcoming referendum however has forced closet Tory europhiles out into the open illustrating the narrow fallacy of tribal loyalties. With a referendum now based on boolean outcomes weasel party political words (with personal ambitions very much in mind) simply don't cut it and are increasingly looking ridiculous. 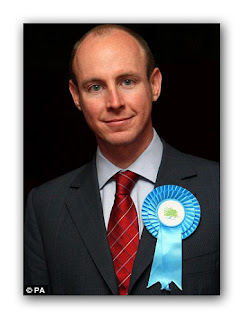 A classic example is Tory MEP Dan Hannan. He has made his career out of eurosceptic rhetoric which suits the Daily Telegraph. Yet despite his copious media appearances expressing so-called Tory euroscepticism, this blog has rarely been convinced of his anti-EU principles. Hannan has a long history of convoluted intellectual gymnastics where our membership of the EU is concerned. When we have to go over the top he's going to be found wanting. DP Jo Coburn: "To be honest, Dan Hannan, there would be nothing that would satisfy you?" Hannan; "Not true...I have repeatedly set out what I think would satisfy most people. Parliament should ultimately be sovereign, in other words the EU should not be able to automatically strike down parliamentary statutes. And we should have freedom to trade with more EU countries. And we should be able to opt out of some of the areas of EU policy that have nothing to do with economics or trade such as criminal justice, environment, defence and agriculture and fisheries - if we can get those things everyone would be in favour with it". There we have in plain sight Hannan loyally supporting the Cameron and Tory line explicitly arguing that he favours EU membership albeit under nonsense 'reforms'. None of what he says would be necessary if we actually left. But to soften us up for the Tory line he lays the eurosceptic groundwork at the beginning of the interview before knifing us with the killer pro-EU mantra. Thus Vote Leave has appointed a "remain reformer" in Hannan. On its own it maybe a mistake but Vote Leave is also run by Matthew "supports a two tier Europe" Elliott and Dominic Cummings whose contortions over Article 50, as Mr Bexit makes clear, makes him not only a liar but is deliberately using distortion to back reform not exit. To appoint one EU reformer may be regarded as a misfortune; to appoint two looks like carelessness, to appoint three looks like a Tory pro-EU stitch up. Vote Leave is fundamentally not fit for official designation. Vote leave, vote remain - the message is clear.